During this last year I have made it my mission to shake things up a little, I mean after all I have to at least show that I am actually learning something about nutrition whilst I’m sitting in lectures for hours on end. So my mission has been to try to offer as much variety as possible to our diet throughout each week. Breakfast was always going to be the challenging one, as not only do we all have our faves, but we are also faced with the dreaded morning time constraints and maybe a little less compliance from the smaller people in our house (and by that I am not referring to the dog or two cats who frankly would eat anything you fed them, if only it was that easy). So my plan was simple, if I could succeed in alternating each person’s three or four favourite breakfasts throughout the week, then not only would I provide some variety, but hopefully also ensure that they were getting the right nutrition. So, to our children’s disappointment, super sugary cereals don’t feature in our house, options are simply, gluten-free multigrain flakes (which do contain some sugar and yes are processed), gluten-free muesli with chickpeas, seeds, nuts and a little honey; eggs; yoghurt with chia seeds, berries, seeds and then the magical oats. Oats is a firm favourite in our house, so I work this baby each way I can. Sometimes (well maybe a little more than I let on), I get it wrong and breakfast seems a little more tense than usual, but mostly it hits the spot. Today’s recipe is one that we all love. It is simple and the cinnamon and Aguaje offers a little comfort on these chillier autumnal mornings. I have written about the amazing benefits of the Aguaje super fruit, which you can read in an earlier post here. So what’s so good about Oats? Oats contain a specific fibre known as beta-glucan, which has proven to be beneficial in lowering cholesterol. Just one bowl of oatmeal a day has been shown to lower cholesterol by 8-23%. 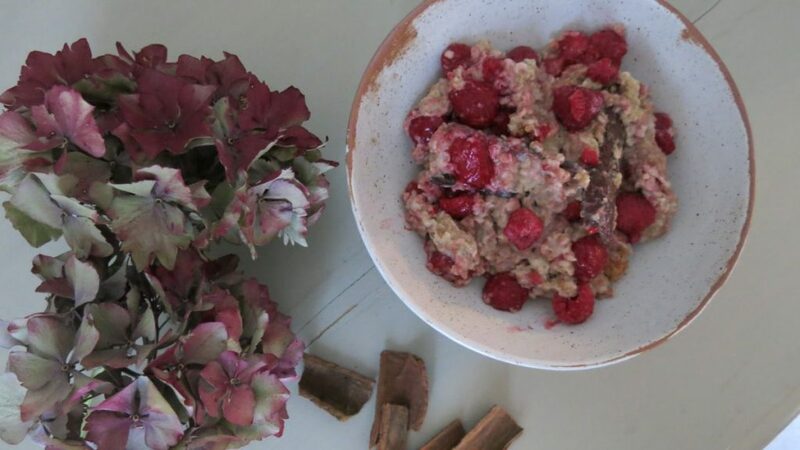 Oats also contain a phytonutrient, known as avenanthramides, which is a unique antioxidant that is known to protect low density lipoprotein (LDL) from oxidation, thereby preventing fatty deposition around the inner walls of the arteries (preventing atherosclerosis). Oats is a good source of magnesium, a mineral that promotes good heart health by keeping blood vessels relaxed. Studies show that oats trigger a much lower rise in blood sugar in patients with Type 2 diabetes compared to bread or rice, so a really important way to start the day! Oats contain high levels of short chain fatty acids, which are believed to possess potent anti-cancerous activity. Studies have shown that the short chain fatty acids, such as butyric acid stunt the growth of carcinoma cells and induce programmed cell death (apoptosis) in carcinoma cells. Furthermore studies have found that oats contain lunasin, a cancer preventative, anti-inflammatory and cholesterol-reducing peptide that was originally isolated from soy. Oats come in many different varieties, some a little more processed than others. The most nutritious oats are those less processed, like oat groats (Scottish oats or oatmeal) or Steel cut oats, which is the same as oat groats, but has been cut with a steel blade. Processing often destroys the most nutritious parts of foods and in oats it is the outer layer as well as the outer layer of the kernel in the barn fraction of the oat grain that holds the highest antioxidants. So try to choose wisely. 1. Pop the oats, milk and cinnamon in a pan and bring to boil. 2. Then simmer for around 7-8 minutes. You don’t want a solid consistency as you will be adding some other wonderful ingredients in that will bulk it up a little more. After about 8 minutes remove from the heat and stir in 2 tbsp of ground flax seeds, which will provide you protein, Omega 3’s and act as an anti-inflammatory. 4. 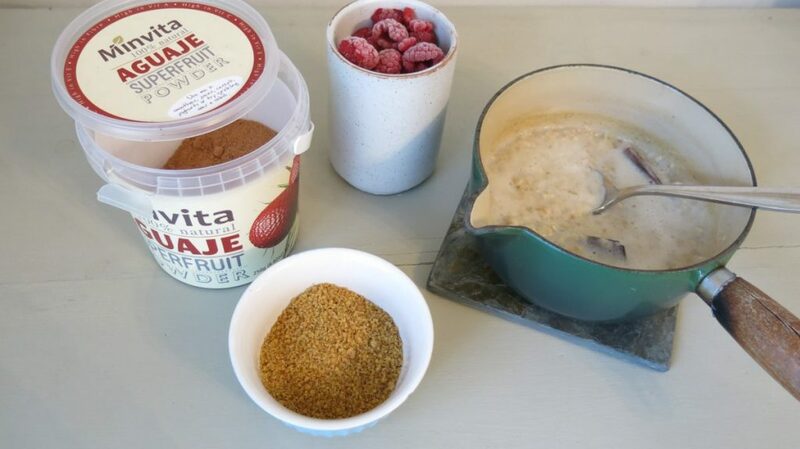 To add a little autumn comfort, sprinkle a little ground cinnamon over your porridge. You will feel full for long and avoid the horrible blood sugar crashes we so often get when we eat a light and unhealthy breakfast. What’s even better still is that your body will thank you for all the goodness that you are giving it. Cinnamon is another great way to balance blood sugar and add a little sweetness. Why not add some pumpkin and sunflower seeds to add some additional essential fatty acids to your breakfast. Nutritional Information: Calories - 389Kcal, Protein - 11.5g, Carbs - 65, Fat - 12g, Fibre - 25g. Osiecki, H (2015). The Nutrient Bible, 9th Ed.